Powerful inspirational quote by W.E.B Dubois, a great African American Hero. 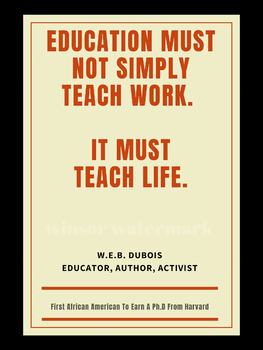 Dubois was the first African American to gain a PhD from Harvard University. He was also an author, educator and tireless advocate for the advancement of people of color. This print is great to encourage, to use in your office, home, classrooms, home schools and for Black History Month or Women's History month displays and celebrations. Poster measures 18 by 24 inches. Features the quote: "EDUCATION MUST NOT SIMPLY TEACH WORK. IT MUST TEACH LIFE." This is a digital product, no physical product will be shipped to you. You will receive one jpeg file. The watermark on the picture will disappear once you purchase and download begins. After purchase, download directions will be given.